You have to feel sorry for Chief Information Officers. Just as they finally prove their worth to the business, a new job title turns up in the boardroom and tries to take credit for all things digital: the Chief Digital Officer, or CDO. The CDO is the “transformer in chief,” or chief disruption officer, with the responsibility for questioning how technology can benefit the business. The goal of the CDO is to help the organization implement new business models and processes that blur the digital and physical worlds. It’s one of the hottest new executive jobs in corporations around the world. The CDO Club estimates that the number of CDOs worldwide are currently doubling each year. Over the last few years, digital disruption has resulted in big changes to IT organizations. After the custom-made software of the early “IT craftsmanship” era, the era of “IT industrialization” brought us large-scale enterprise information systems, with an emphasis on consistency and efficiency. Today’s CIOs have spent most of their careers in the industrialization era. But now we’re in the Era of Digitalization, and IT has moved to the core of business strategy, providing continual opportunities for growth, innovation, and differentiation. Information is no longer something that helps executives make better decisions — it’s now a critical part of the customer experience. And the right skills for the industrialization era are not necessarily the right ones going forward. For example, we’re moving from the notion of customer “loyalty” to the notion of customer “royalty.” All of us now expect the kind of treatment that was reserved for VIPs in the past. We expect our vendors to treat us as individuals, to recognize us, to know what business we’ve done in the past, and to make personalized recommendations based on the current context. All of this depends heavily on existing information systems, but requires more real-time operations and more agile development cycles than in the past. And information systems are now the foundation for new business models. For example, a family-owned manufacturer of air compressors is using the Internet of Things and predictive maintenance to switch from selling equipment to selling compressed air as a service. And a manufacturer of next-generation forklift trucks is looking at pricing based simply on the weight of goods being lifted. The future of IT is less about servers and more about business opportunities, and some organizations have chosen to create a new executive position with this in mind. What does a CDO actually do? Today’s Chief Marketing Officers (CMOs) are well aware of the possibilities that new technology offers to differentiate from the competition and are predicted to outspend CIOs on tech by 2017. But many CMOs are hopeless at technology. The CDO role helps bridge the innovation gap between the CIO and the CMO: using the latest technologies to help focus on customer needs. If we wanted to completely disrupt our industry, what kind of company would we start? How do we become that company? In addition, faced with the new opportunities, many companies have implemented digital initiatives as a mess of disconnected, inconsistent, and sometimes incompatible activities. Organizations that want to become digital need someone with a holistic view of how all the initiatives come together and who can shepherd them through the change. To succeed, the CDO needs to be part leader, part bridge builder, and part evangelist. 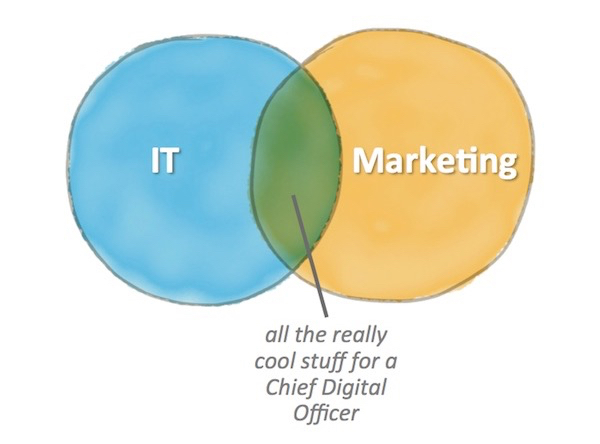 Why a CDO rather than a CIO? First, today’s CIOs have plenty on their plate coping with the changes required to technical infrastructures. Separating out the innovation role can ensure that it gets the executive priority it deserves. Second, the CIOs knowledge of tried-and-true methods of performing IT “better, faster, and cheaper” may no longer be enough. Organizations are being forced to become more creative and inventive. They must be willing to tear down the walls between different functional silos and support new ways of working, new modes of communication, and processes of continual innovation. The chief challenge in digital is not technology but people. CDOs need to help break down silos and rethink the organization. It’s more important for CDOs to have great “analog” skills such as diplomacy, creativity, empathy, and change management. They must also be extraordinary people leaders: Digital talent is in high demand, and they need to be magnets for the best. Accordingly, many Chief Digital Officers don’t have an IT background. Instead, they are seasoned general managers. SAP’s Chief Digital Officer, Jonathan Becher, is a great example. He was an entrepreneur at a small startup, then became Chief Marketing Officer of SAP, and now he’s Chief Digital Officer, charged with creating a new direct-to-consumer business model. How should CIOs and CDOs work together? Clearly, there should be a tight partnership. The CDO should be able to concentrate on how to use the latest technologies to improve the customer experience, while the CIO looks after daily operations, obsesses over data governance, and finds ways to cut costs. In practice, however, the roles are bound to overlap. Where does “operations” stop and “innovation” begin? After all, the Industrialization Era of integrated ERP systems ultimately resulted in considerable customer experience benefits as well as internal efficiencies. Organizations that want to innovate must rethink their core business and operations, not just bolt some extra technology on top. Investments in real-time systems are increasingly essential and will require close collaboration between the CIO and the CDO. Just as the role of CIO has meant different things to different organizations in the past, each company must work out how best to combine the responsibilities of keeping today’s business running smoothly with preparing for the business of the future. Many believe that the CDO will ultimately be a temporary role, a short-term fix for a problem that will go away as “digital business” becomes normal business — just as there are no longer any “Heads of e-Business” in organizations today. For example, Gartner believes that the business innovation role of IT will ultimately come back under the CIO title (potentially becoming Chief Innovation Officer) and that the practice of using CIO to refer only to back-office functions will decline. Want more insight on today’s hottest new executive role? See Why Adopting A Chief Digital Officer Mindset Is Not Digital Washing.